In the timely and important book Promise and Challenge, twelve Catholic women—leading scholars and eloquent writers—consider the role of women in light of Pope Francis’ call for “a more incisive female presence” in the Church today. The authors, who include religious sisters and married women, draw upon their various backgrounds in theology, philosophy, economics, and law to engage timely questions: Where is the voice of Catholic women in the public square? What is complementarity? Do women have a prophetic role in the Church? Tackling these issues—and many more—the authors explore both the challenges of today and the promise of tomorrow for women in the Church. In 2014, a symposium was held in Washington D.C. to discuss women in the Catholic Church today. The context was Pope Francis's call for a more "incisive presence of women" and the development of a "profound theology of women." Twelve of the symposium participants have been thinking and writing about this topic for a long time, living it out in their communities, and were asked to submit a paper for publication in "Promise and Challenge". So what do they have to say about the Pope's words? What do an "incisive presence" and "profound theology" look like? This compilation reflects the thought and wisdom of key women in the American Church representing one school of thought: that the magisterial teachings of Pope John Paul II and others offer a sure guide to a deeper understanding of the feminine genius and grassroots progress. 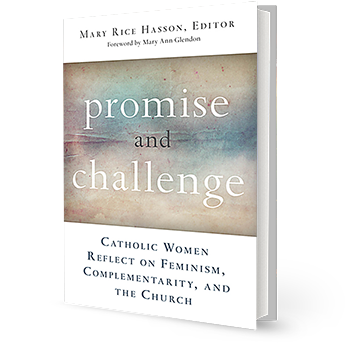 The book "Promise and Challenge: Catholic Women Reflect on Feminism, Complementarity, and the Church" raises important questions about the presence and role of women in the Catholic Church today. As part of the continuing conversation, S+L interviewed the Rev. Dr. Dorcas Gordon, Principal and Associate Professor of Biblical Interpretation and Preaching at Knox College in Toronto, and asked her to reflect on some of the key questions from a Protestant theological perspective. Mary Rice Hasson is a Fellow at the Ethics and Public Policy Center in Washington, D.C. where she directs the Catholic Women’s Forum, an initiative that responds to Pope Francis’s call for Catholic women to assume a higher profile within the Church and to think with the Church in addressing the problems of today. 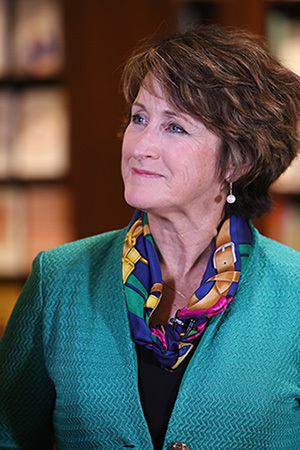 She is the co-author of the ground-breaking report, What Catholic Women Think About Faith, Conscience, and Contraception (EPPC, 2012), which offered new data and analysis of the views of church-going Catholic women, ages 18-54, on faith, conscience, and contraception. She is currently writing a book that proposes ways to engage Catholic women more effectively on topics related to sexual morality, conscience, and reproduction, in order to accompany women towards a deeper life in Christ. Mary is a graduate of the University of Notre Dame and the University of Notre Dame Law School. Mrs. Hasson and her husband, Kevin J. “Seamus” Hasson, the parents of seven children, have been named the recipients of the 2015 Saint John Paul II Award for the New Evangelization.